Aside from the 3.07 hours it took me to run further than I’ve ever run before, it feels like the rest of my focus this weekend has on food. Acquiring it, fixing it, eating it. Reading about it. Asking vendors at the farmers’ market about it, even. Researching where to buy seeds to grow it. Food, food, food. This is either because there are signs everywhere that winter is around the corner, so we’d better start stocking up, or because I burned enough calories during that 3:07 that I’m probably still hungry, regardless of all I’ve eaten. About a month ago I signed up to do the 27k Surf the Murph trail race. My main race this year was the Ragnar Relay, back in August, but I’ve been enjoying some of the fitness that training for it provided by doing a few other races, before the snow and ice hit. The TC 10k road race in early October was fun, and I felt reasonably speedy. I was overdue for a trail race, as the last one I did was in April, at the Trail Mix 50k (of which I did just 12.5k, as part of a team). For this race, speed wasn’t my concern at all, in fact, it’s been a few years since I covered that distance on trail, and I was a little worried that my longest trail “distance” recently was a 1:45 run I did last weekend. I was reasonably sure that I would finish, but what I wasn’t sure about was how it would feel, the last hour of it. I was sure, however, that unless conditions were outright nasty, I would have a good time and the event would recharge my spirit for a good long time. Maybe even until spring, or at least until I get out alpine skiing this winter. The stunning scenery, the great people, even the exhaustion, these are things I need. So, the food thing this weekend all started with the power porridge I cooked on Friday night, knowing that in the morning I’d have little time for cooking it, but plenty of desire for its runner-fueling qualities and certainly enough time to take it out of the fridge and nuke a portion. Oatmeal is my traditional pre-race food, and most of the time I’m perfectly happy with a bowl of the instant Quaker variety, mixed and nuked up on the spot. For summer races often that’s all the effort and heat I want to put into it. But, somehow, the current month inspired me to to a little advance prep – and to use a blend of grains and fall spices that would warm up my morning. Quinoa, amaranth, steel-cut oats, cloves, cardamom. 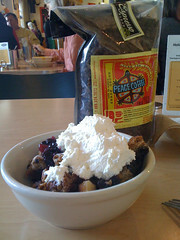 Plus a “marmalade” of whipped cream, toasted pecans, and toasted coconut. A few hours later, Chris, Joe, I and about 125 others were running. Up and down, a lot of it: the first third of the course was extremely hilly. The first 20 minutes seemed to take forever: this was how long it took my cold fingers (even within thin mittens) to warm up. Then suddenly, we were at the 2nd aid station and a full hour had passed. I was floored; this surprise gave me a confidence boost. I downed some energy drink, a few pretzels, and my first pack of Gu; I’d eaten one grape (I’m not sure why; maybe I was wondering if, given that it’s Halloween weekend, it might be peeled? I had to find out) at the first aid station, 3 miles in, and I’d been using my Camelbak to take on water pretty regularly. Shortly thereafter, we were in the less hilly middle area of the course. At this point, about five of us, three of whom were strangers to me until this time, started to stick together, forming a sort of pace line. Our paces were similar, we had a good time talking about whatever, helping each other out if we tripped, missed a turn, or needed to stop and walk up a nasty hill. This was well, great. I met some more really wonderful people and spent two hours playing in the woods with them. What’s not to love? Calf cramps, that’s what. Somewhere in this area was when my calves started to talk to me: until the very end of the race, I was playing a strange game of calf-cramp management. At the middle aid station (or two?) I’d grabbed a few pretzels and a peanut butter & jelly sandwich quarter, so I was reasonably sure the cramps weren’t electrolyte-depletion related. Over the last month or so I’ve been adapting to a new shoe & insert arrangement. I was forewarned that it would take up to two months to adjust, and that my big toe, arches, and calves might very well bear the brunt of the adjusting. Well, calf exhaustion came early, and I found myself in the peculiar position of trying to relax my calf muscles while running a trail race. Not surprisingly, this made other areas of my body work harder. Left hamstring, in particular. So, the last half or so of the race, I spent looking for things to draw my attention away from the annoyance in my legs. And the distraction came in the last third of the course: the fun zone. It amounted to a sort of hopscotch through the park’s collection of stumps, logs and brush that had been removed from elsewhere. This section really wasn’t that long, but it was one machete short of a bush wack, and it had a monster of a hill climb in it – one that nearly had to be attacked using hands as well as feet, it was so steep. I had the one full-on calf cramp of the race on that hill, but I somehow stopped it before losing my balance and rolling backward, bowling over a possible 15 or so fellow racers, Did you know that a sharp intake of breath and muttering an obscenity can make a cramp stop? I know, now. Not that I desire to test it again. After the fun zone, there were still a few miles, or at least a few kilometers: I had no idea but I knew that the end was “near” and that was good enough to keep me going. Chris punched me softly on the arm, I figured to just encourage me as perhaps I looked a bit ragged. I found out a few seconds later that he was telling me that the finish line was right up ahead. I was surprised: I’d already braced myself for another 30 minutes. What a relief! I found a little juice to speed up toward the end: probably not trail-runner behavior, but what can you do? I’ve been running since I don’t remember when, and when you see a finish line, you rejoice with a little kick, if you have it in you. I finished! The reward was lunch at Birchwood Cafe, upon which Chris and I had decided at about mile 4. 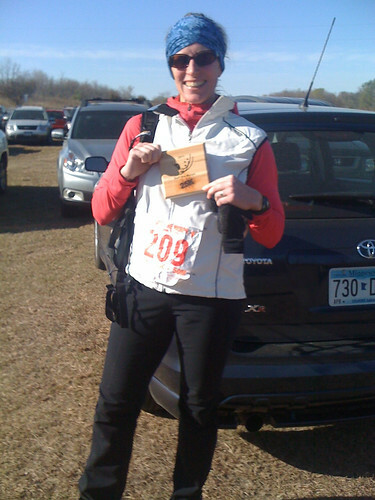 Well, the official reward (aside from memory of the experience) was the race medal: a wooden plaque that we got to brand with our race distance – there was even a DNF branding-iron option that, earlier in the day when I learned of it, I found oddly attractive. Not attractive enough: I’ve now run further than I’ve ever run before. Not a whole lot further (about 2 miles), but still, further. And, at a slightly faster pace than the prior longest distance. As I get older and possibly look to longer races, this may not be the wisest measure to focus on, but it feels good to feel speedy, and of course, that means that I was on my feet for fewer hours, which in the endurance game is a good thing to consider. Chanterelle’s Breakfast Waffles, at home, today. I think I found the perfect waffle recipe, finally! One sinful red velvet cupcake from Byerly’s, today. Dang, they nearly put Cup•Cake to shame. And with that, I can say that this year’s competive running season is over, for me. I’m looking forward to next year: a few trail races for sure, and possibly a road marathon. It’s been a great year, of runs enjoyed with friends, of challenging training, and of lots of laundry. God bless Body Glide. Next ›Are You Ready for This?